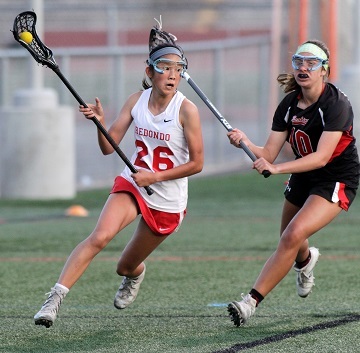 Riding a seven-game winning streak, Redondo’s girls lacrosse team avenged its only loss of the season with a strong second half in its showdown with rival Palos Verdes as the Sea Hawks enjoy their Spring Break this week. After losing to Palos Verdes 10-8 on March 13, Redondo defeated the Sea Kings 14-8, scoring 10 goals in the second half to pull out the win. Jordan Davis leads the team with 42 goals and has 11 assists while Emma Hodges has 25 goals and 26 assists. Other top performers are Addy Bass (36 goals, 7 assists), Caitlin Hanniff (21 goals), Marianna Gamet (15 goals, 11 assists), Sophie Ristorcelli (7 goals, 6 assists) and Caroline Brand (6 goals, 2 assists). Redondo and Palos Verdes will likely finish as Bay League co-champions. Redondo has won 11 league titles in a row (7 champion, 4 co-champion). On April 2, Redondo kept its winning streak alive defeating visiting Crescenta Valley 15-8. Redondo has an impressive 10-1 record and is ranked No. 2 in the CIF Southern Section, No. 4 in the state and 11th in the nation. Palos Verdes entered the week with a 6-1 record and is ranked No. 3 in CIF, No. 7 in state and No. 14 in the nation. The Sea Hawks return to action Wednesday with a home game against Peninsula. Redondo will then take on Mira Costa (Apr. 19) before hosting Foothill, the top-ranked team in the state and 4th in the nation, on Monday, Apr. 22. “I’m very pleased with the season so far,” Borgia said. “We have beaten six teams that were ranked in the top 10 in LA County when we played them and two solid Orange County teams, so we have played a really strong schedule. We are looking forward to the challenge of playing Foothill. They are undefeated and it’s a great opportunity for us to get ready for the playoffs. Coming off three consecutive losses, Mira Costa (5-6) traveled to take on Birmingham on Wednesday and will play at Glendale (No. 11 in CIF) on Friday. In boys lacrosse, Palos Verdes (11-1) is ranked No. 2 in CIF-SS, No. 4 in state and 9th in the nation. Mira Costa (9-2) is ranked 14th in the CIF-SS poll, entering the week with six consecutive wins. The Mustangs hosted Eastlake on Tuesday before taking on visiting Palisades today. Mira Costa wraps up the regular season at Sierra Canyon (Apr. 16) and at home against St. John Bosco (Apr. 18). After losing to Mira Costa 11-4 and St. John Bosco 6-5, Redondo has won three in a row with wins over Valencia 18-1, Notre Dame (Sherman Oaks) 14-6 and Glendale 13-1. Redondo (7-6) hosts Peninsula on Tuesday before traveling to face St. Francis (Apr. 18) and Village Christian (Apr. 27). For results and schedules, visit maxpreps.com.